9 To 5 Job Killer Review - Scam or legit? PURE TRUTH revealed! 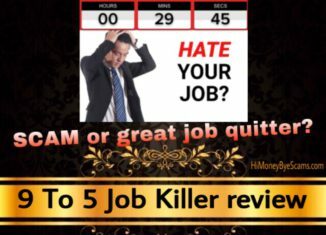 Home > Online opportunities > 9 To 5 Job Killer Review – Scam or legit? PURE TRUTH revealed! Looking for an honest 9 To 5 Job Killer review? Are you wondering if 9to5jobkiller.com is a scam? Or is it a legit system that will allow you to quit your job? If that’s what you want to know, I’m glad that you have found this post because here I’ll show you what this program is really about. As you may already know, there are too many fraudulent websites out there, so doing your due diligence is the way to avoid scams and discover the legitimate way to earn residual income every day. When it comes to 9 To 5 Job Killer, it’s not as amazing as portrayed in the sales video, and here I’m going to reveal what they haven’t told you. 2 What is 9 To 5 Job Killer? 3 How does 9 To 5 Job Killer really work? 4 Is 9 To 5 Job Killer a scam? The second I saw the 9 To 5 Job Killer sales page, I thought I was in front of another program that would promise the world but deliver very little because the layout of the page was very similar to other scammy pages I came across in the past. However, I didn’t think that judging this system based on the sales pages appearance was a good idea, so I took the time to look deep into it and do my homework before reaching any conclusion. The sales video for 9 To 5 Job is very similar to other sales videos I have watched and it even has the same sales pitch as other videos, which made my think that I was not wrong when I thought this one wouldn’t be different from the others. Jeff, the owner of this program, claims you can finally quit your job and start having a lifestyle of your dreams where you can travel the world without worrying about money. He claims this is not like the other scam videos, but I have my doubts because I have heard the same thing lots of times. Many con artists say that they are different but they don’t do anything to prove it, so I have a hard time believing people whose actions don’t match their words. Anyway, he says that this system works for people who have no experience or special skills. They are supposedly making from $5,000 to $10,000 a month and more. Sounds cool? We can also see some video testimonials who claim to have earned thousands of dollars on their first week or within a short period of time, which sounds amazing and it can definitely give you hope. So what is 9 To 5 Job Killer really about? It’s a step-by-step video training course that will teach you how to set up a business from home. However, there are some important things that Jeff doesn’t mention so the sales presentation is not much accurate. But you need to hurry up because he’s not going to keep this training forever and only a few people can access it. Well, that’s what he says but I personally believe this is a fake scarcity tactic because he would never limit the amount of money he can make, so he’s not going to refuse any payments. He basically tells you everything you would like to hear just to get you excited about this system, but he doesn’t tell you what it takes to make money with this training program. How does 9 To 5 Job Killer really work? First of all, 9 To 5 Job Killer is not even the real name of the real program they are selling. You see, there’s not a logo or title for 9 To 5 Job Killer, which is the first thing that made me start suspecting this wasn’t a real system. Not only that, Jeff Lerner doesn’t even mention the name “9 to 5 job killer”. Instead of that, he mentions 6 Steps To Freedom, which I reviewed some months ago. 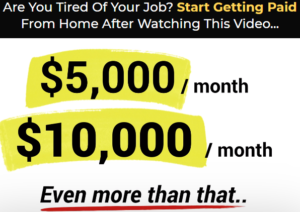 9 To 5 Job Killer is basically a page that he or one of his affiliates are using to funnel you into 6 Steps To Freedom, which is the same as the Ultimate Laptop Lifestyle program. The fact that this program has been marketed under different names is a red flag because this is something that makes it misleading. When a program is good, there’s no need to change its name or hide the real name from potential customers. So, if it was that awesome, don’t you think they wouldn’t have had to change the name? One of the reasons they are doing this is to prevent potential buyers from finding the negative reviews. The thing is, this program doesn’t work as easily as they have told you and it also has hidden costs. The $39 initial fee is just the beginning, so you will have to spend way more than that to make the kind of money they talk about. This is a “pay to play” system that requires you to purchase the products you want to earn money from. When you pay $39 to get involved, your recruiter will earn a commission. In order for you to make money, you will have to get other people to pay for the same products you have bought. In other terms, this is about recruiting other people into the same system and make them buy Jeff Lerner’s products, which have been designed to make money with this business opportunity. Your 1-on-1 advisor a.k.a. your sponsor will try to get you to upgrade so that he/she can make more money. This is the same you will have to do with the people you recruit. Everyone involved in this system does the same and promotes the same, it’s a never-ending cycle. Remember that Jeff claims this is risk-free because you can get a refund? Well, the truth is that this is highly risky because you can only get your money back when it comes to the $39 initial offer. They don’t offer any refunds for the high-ticket products that cost thousands of dollars. Therefore, there’s the possibility that you lose money if you spend thousands of dollars to get the right to promote the high-ticket offers but don’t make enough sales. For example, if you want to earn $500 commissions, you will have to spend $1000 or more and make at least 2 sales to make your money back. Not only that, you also need to take into consideration other costs like the cost of getting traffic. That’s why this is not risk-free. They usually recommend members to pay for traffic because this is the fastest way to get customers. But it’s also highly risky and not recommended for beginners or individals with a low budget. Paid advertising requires a lot of testing to find out what works and what does not work, so if you take this path, you need to be prepared to lose some money before finding the right formula for you. Is 9 To 5 Job Killer a scam? It’s possible to make money with this system, but it’s not the best way to build an online business. For some people, 9 To 5 Job Killer is not a scam because you receive some training for your money. But for others, it’s a scam because the sales presentation is pure hype and the real program is not as awesome as advertised. Something that I believe you need to consider is their earnings disclaimer because that’s where you find the truth about making money with this program. As you can read, you cannot expect to achieve the results they talk about in the sales video. They even state that you will probably spend more money than you earn. So why doesn’t it work like Jeff tells you in the sales video? The truth is that it was designed for only a few people to profit. Most people who get involved in these kind of systems end up earning very little or losing money because they are highly expensive. This program works in a similar way as other high-ticket systems that have got shut down by the FTC, such as MOBE and Digital Altitude. They ended up being pyramid schemes that made a lot of people lose money, not to mention that some members even got further into debt because they were convinced to get loans to spend money they didn’t have on the high-ticket products. In my opinion, 9 To 5 Job Killer is a scam because it’s not the name of a real system or program and it doesn’t give you realistic expectations about making money online. When it comes to 6 Steps To Freedom or other Jeff Lerner’s products, it’s possible to profit from them but this is not the way to go to build a long-term online business. So, what you end up doing is up to you, but I have to conclude that I do not recommend 9 To 5 Job Killer. When it comes to generating a substantial income online, it’s best that you use a sustainable business model that has been working for decades. The problem with programs like 9 To 5 Job Killer or 6 Steps to Freedom is that it uses a business model that’s not sustainable for the long-term because it doesn’t benefit everyone involved. It only benefits a few people, as I explained. I’m glad that I found a business model that was legitimate and didn’t require me to recruit other people or spend thousands of dollars on expensive products. This is the kind of business that doesn’t require you to create your own products, but you will not have to promote the same as everyone else. You will be able to choose between millions of products to earn money from! Additionally, my free guide also reveals how you can get my personal guidance and how you can get support from thousands of Internet entrepreneurs, so don’t be shy and ask questions whenever you need help! And now let me ask you: Will you keep wasting your time on expensive high-ticket systems? Or will you get on the right way to build your online asset today? I hope this 9 To 5 Job Killer review has been helpful to you and you will make the best possible decision. Beware of these Instagram scams!